For some unexplainable reason, we missed out on playing Sushi Mushi when it first debuted October 16. Of course, better late than never. This free-to-play gem from Aspyr Media is a shining example of asynchronous multiplayer done right. The game even tempts us to spend real cash via in-app purchase. Considering how cheap we normally are with this sort of thing, that's quite an achievement. On that note, Sushi Mushi tasks you with matching three or more similarly-colored pieces of sushi to form rolls, whereupon which those tasty-looking bits disappear to make room for another random batch that falls from the top of the screen. You do this through four highly competitive rounds against another person, discovered through Facebook, email or at random. Each round lasts 90 seconds, and you basically match like crazy to earn as many points as possible. The match-three gameplay is addictive by itself, but power-ups really make this title stand out. You're free to equip up to two per round, each of which gives you an all-important advantage, whether that involves putting an additional 20 seconds on the clock or highlighting specific types of rolls. That said, power-ups cost coins, which are generally difficult to come by. You earn a small amount from winning games and matching up to three like symbols during a slot machine mini game, but more often than not, you'll barely have enough to scrape by. The developers put coins up for sale via in-app purchase, and quite frankly, it's worth spending a few bucks to have some on hand, because there's a great chance your opponent has done the same, and plans to use power-ups whenever possible. 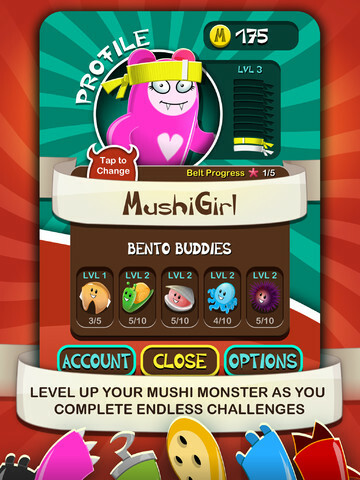 We usually steer clear of spending money for free iOS games, but with Sushi Mushi, it actually makes sense if you plan to achieve a respectable win/loss record. As for the aforementioned slot machine game, you can only play it if you have a special fortune cookie, which you can send to other players and vice versa. Nice touch. Not only that, but you can have several games in progress at the same time, thus increasing the odds of always finding someone willing to play. This means, more often than not, you'll have something to do. On the downside, Sushi Mushi suffers from performance issues. There's a whole lot of stuttering that takes place while cycling through menus and during score tabulation. We've also had the game crash a handful of times. It clearly needs an update, and at this point, it remains to be seen whether Aspyr will release a fix. 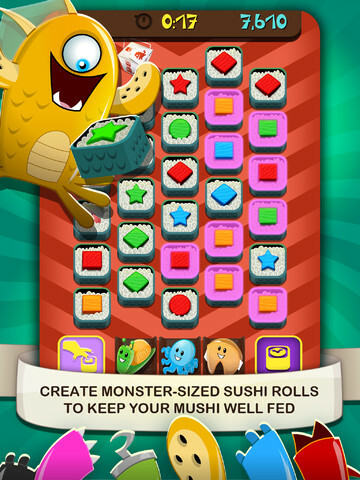 Thankfully, the game runs decently enough most of the time, and that being the case, Sushi Mushi is one of the surprise gems of the App Store, an attention-grabbing match-three puzzler that'll provide hours of enjoyment, while making users the slightest bit hungry in the process. Recommended. What's Hot: Ten different monster avatars to choose from, addictive match-three gameplay, asynchronous multiplayer, you can host several games at a time, game changing power-ups, in-app purchasing that makes sense, free. What's Not: No single player mode, obvious performance issues.